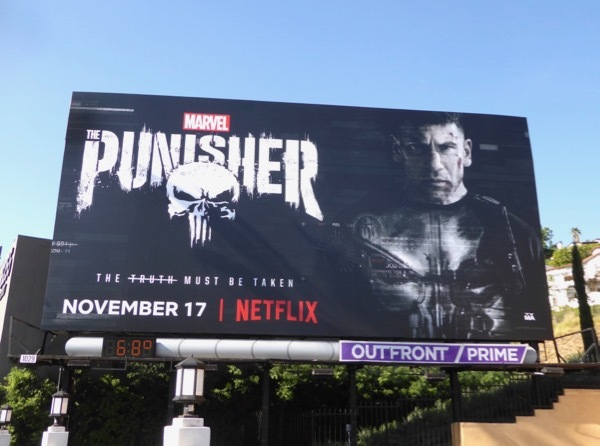 'Frank Castle' aka 'The Punisher' first made his comic book debut in The Amazing Spider-man #129 in 1974 and the vigilante's lethal approach to crime soon made him a Marvel fan-favourite. 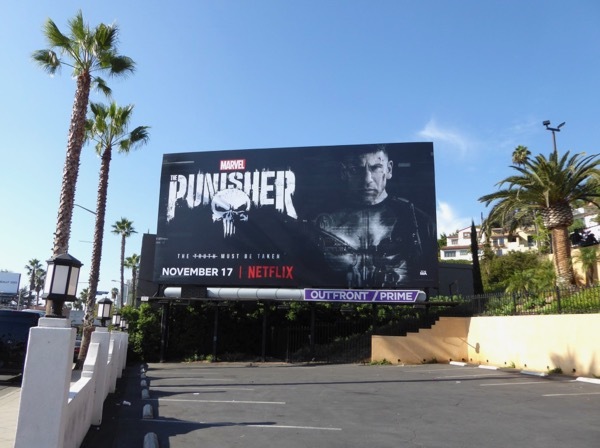 After headlining several solo comics in the 1980s the anti-hero was first brought to life on the big screen by action star Dolph Lundgren in the 1989 movie, followed by a rebooted live-action movie in 2004 starring Thomas Jane as the titular character and another cinematic offering with Ray Stevenson in 2008's Punisher: War Zone. 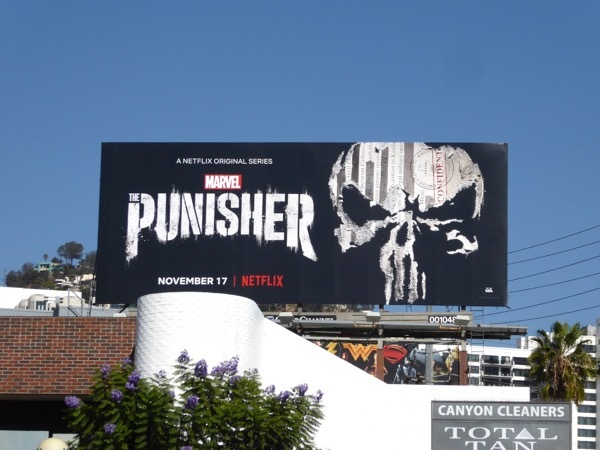 Last year in the sophomore season of Netflix's gritty street-level superhero series, Daredevil, The Walking Dead's Jon Bernthal earned high praise for his depiction of the former damaged Marine out for revenge after his family are gunned down in the crossfire of a gang war in Central Park. 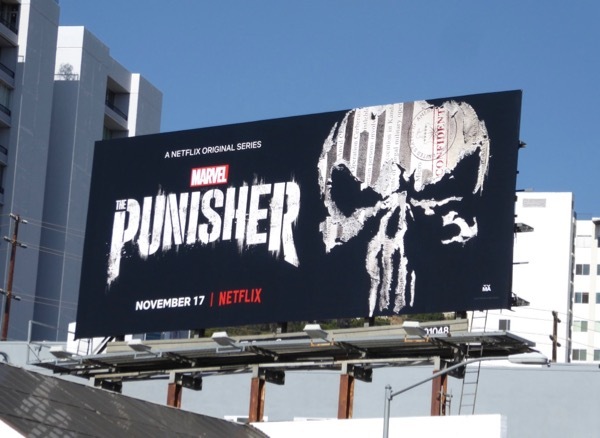 In his solo spin-off this one-man-war-on-crime is back in action for thirteen episodes sporting his iconic skull design and aided by Deborah Ann Woll's reporter 'Karen Page' and Ebon Moss-Bachrach as 'Micro', a former NSA analyst, as the FBI and CIA have Frank Castle in their sights (and he has everyone else in his). 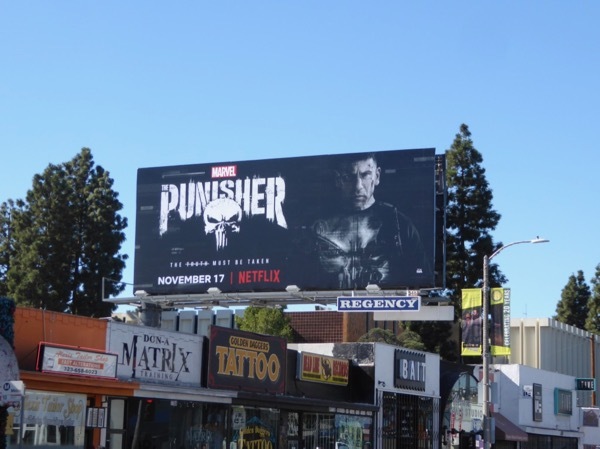 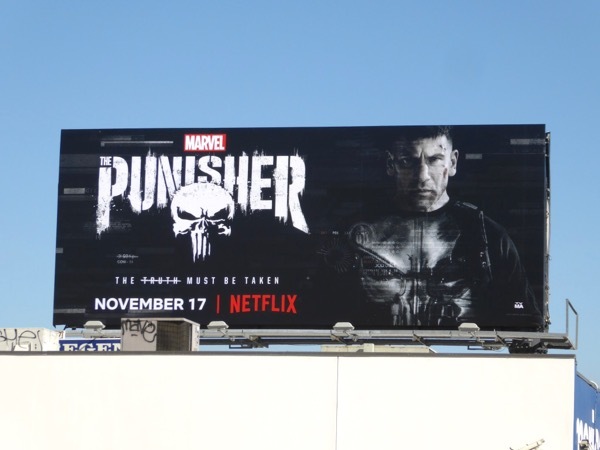 These series launch billboards for The Punisher were photographed around the streets of L.A., including along Melrose Avenue, Santa Monica Boulevard and the Sunset Strip, from November 6 to November 11, 2017. 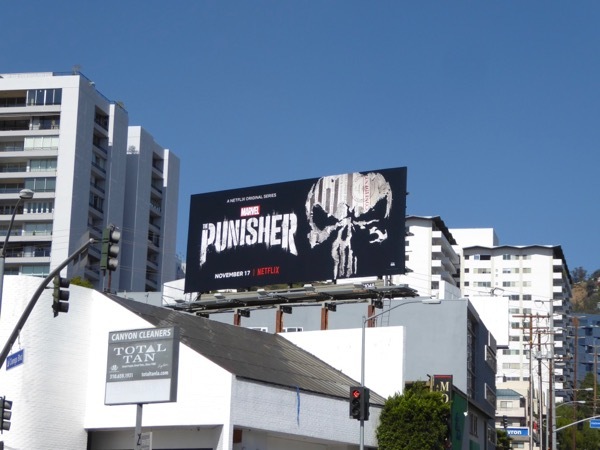 Fans of the popular Marvel vigilante can also check out these Daredevil season two billboards from 2016. 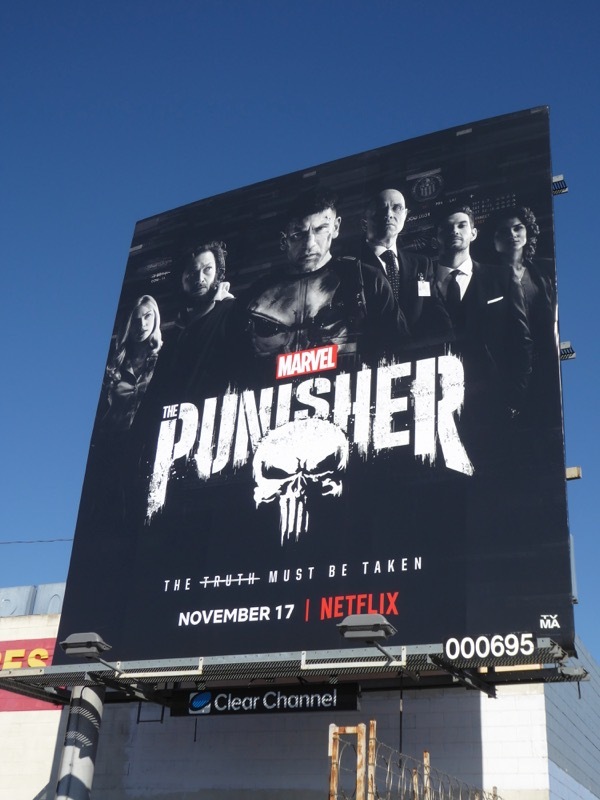 Netflix's Marvel television shows have met with mixed reviews over recent years from the highs of Jessica Jones to lows of Iron Fist, so let's see if The Punisher's own solo series can hit the target and live up to and even exceed viewer expectations. 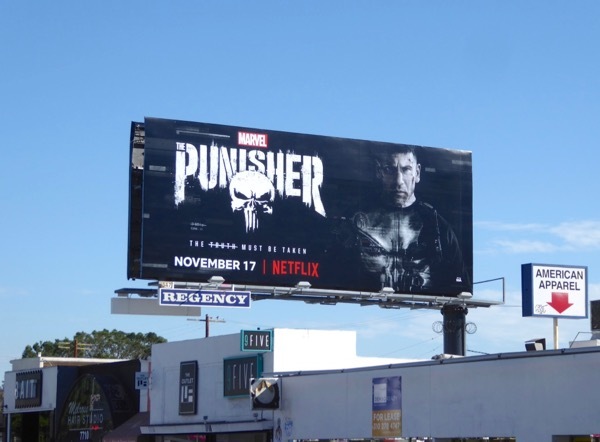 UPDATED: Here another cool ad creative showing more of the cast of The Punisher spied along La Brea Avenue on December 1, 2017.